This has been one of those weeks. The graphics card was fading fast on my last computer so last Thursday I purchased a new desktop. Took me 2 days to get all the upgrades and programs installed. Not bad! I've not done that before, the son or my computer guy has done the majority of that work. But I'm up and running and even got my Print Shop Deluxe 2 to install! That's an old program! So from there I ended up reorganizing my desk. Yep. 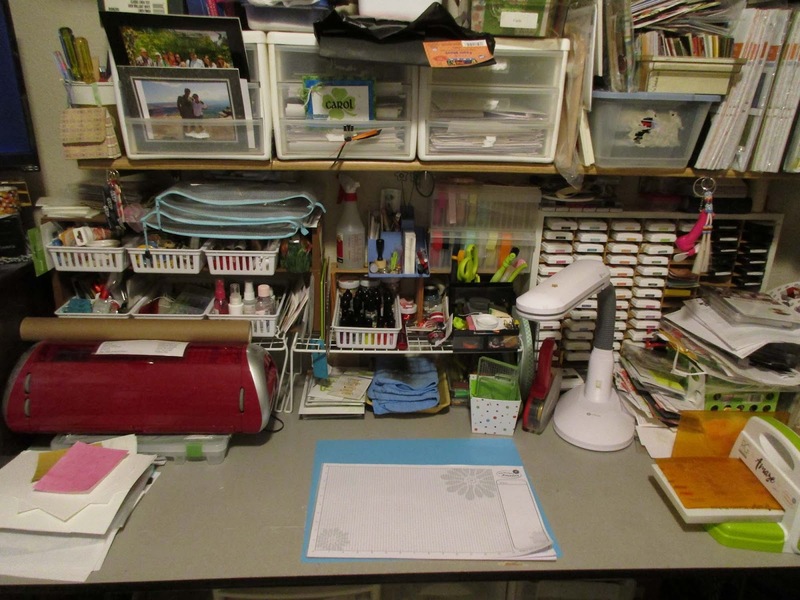 And I'm going to show it to you courtesy of Julia at the Stamping Ground and her weekly What's On Your Workdesk Wednesday! This is week 425 and I've been joining in since about week 185 (just a guess). For more info on how to join in just head over to her place and click on the How To Link for WOYWW page button just under her banner. 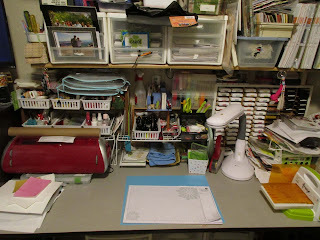 Ok, the first picture, my very tidy desk, was taken Monday as I stood and admired the change. Most of the change is due to selling my Copic markers and rack. Yeah, I did. After not using them for over 6 months and opting for the products from the company I'm with, it was time. 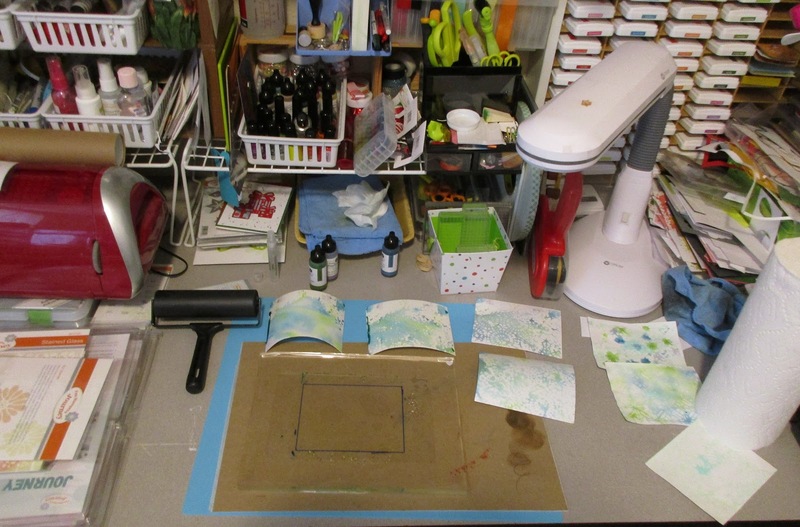 The 2nd picture is my desk busy with my Gel Press. I'm most definitely a novice but hope to get better with time. You can see my Gel Press with a rectangle in it. This A2 card sized marking is on a piece of acetate that is placed under my Press so I have a focal point when playing. Above the press are some pieces drying. These are the nicer pieces I made. Some turned out ugly but I can salvage pieces. I took a class from Sally Lynn McDonald with Gel Press and follow Gel Press Junkies on FB. Fascinating stuff! Today my car is in the shop getting a new Rack & Pinion, the steering mechanism, along with new belts, spark plugs & wires, and maybe hoses (if needed). We're heading to California in a week to see our kids and granddaughters whom we haven't seen in almost 2 1/2 years. I won't be joining in on WOYWW the first 2 Wednesdays of August. But I'll be back! Please head over to the Stamping Ground and check out the desks that are linked. I'll be playing with some of my pieces above and scheduling posts for while I'm gone. I do hope that you will never regret having sold your Copics. I have none in that brand, but I hear they are really nice to use. Perhaps your focus has shifted direction more toward gel printing? Safe travels with joy at either end and plenty of fun time with the kids and grandkids! Gosh Carol, I'm excited for you - a road trip to see the lovelies after 2.5 years...it'll be wonderful! 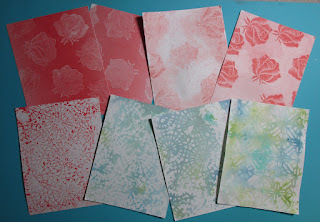 Such a great idea with the acetate for the gelli focus...something I will definitely be copying. YOu're doing some really nice stuff with it. I also really admire your decision to sell the Copics...I barely use mine and so I think your big old collection is much better re-homed. And oh my..just look at your desk!